There are many resources online on how to adjust headlights. Here’s one good one from Popular Mechanics. And a more technical article at the Daniel Stern Website. H1’s are unique in their ability to adjust low and high beams separately – and precisely. Their fluted lens (based on Fresnel technology, the same technology, developed in the 19th century, that is used in most lighthouse lenses) focuses the light effectively. And proper adjustment is critical given their brightness. You want maximum illumination while not blinding on-coming traffic. The following will give you some specifics on how to adjust H1’s properly. 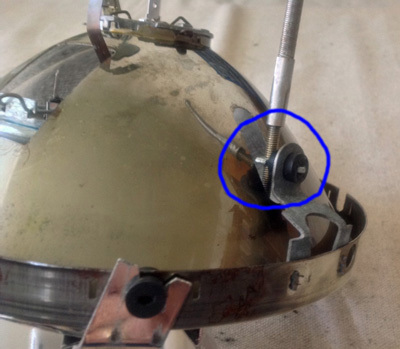 A – Adjacent screws adjust the low beam which is the large bowl shaped reflector. The A with the horizontal arrow under it adjusts the low beam horizontally and the A with the vertical arrow next to it adjusts the low beam vertically. F – Adjacent screws adjust the high beam which is the small wedge shaped reflector at the bottom. The F with the horizontal arrow under it adjusts the high beam horizontally and the F with the vertical arrow next to it adjusts the high beam vertically. A up-down is at the upper right corner. F up-down is at the upper left corner. A left-right is at the lower left corner. F left-right is at the lower right corner. 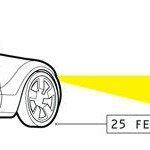 The most important thing is that you adjust the low beam first then move on to the high beam. If things are out of whack it’s possible for the high beam reflector to make contact with the lens which prevents further adjustment. If that is a problem you can adjust it. First pull the metal prong out the rubber. Next hold the prong and turn the adjustment screw in the trim ring clockwise. Next reinsert the prong into the rubber and the small reflector should have moved away from the lens. Then you will be able to adjust the low beam reflector further. Now enjoy your H1 flamethrowers!